After overcoming Schalke at home, Mainz moved up into the top 5 in the Bundesliga, (albeit temporarily) ahead of Bayer Leverkusen, Borussia Mönchengladbach and Wolfsburg. When purely considering the stature of the two clubs, one could suggest an upset was on hand yet a Martin Schmidt has created a formidable side based around the genius of Yunus Malli. The clash featured two man-oriented defences which despite sharing fundamental similarities had some interesting contrasts between the defensive schemes. An important component in Mainz’ defensive system is their compactness. Through two narrow banks of four as well as active support from the two forwards. With a tightly-knit defensive block, the home side benefited through greater quantities of defensive connections and strong control of the three middle columns. Their compactness was particularly evident in the wide areas, where Mainz reacted well to shift across quite dramatically as they looked to close out any space. The touchline is the best defender and Schmidt’s side looked to emphasise that through further restricting Schalke’s usable space in these wide areas. Although momentarily they had a tendency to lack spatial compactness with gaps between the lines emerging for Schalke to move the ball into, Mainz were generally comfortable out of possession. The inside-orientation of the wingers provide much-needed support in the centre. One of the most obvious differences between the two sides was the defensive orientation of the wingers. In Mainz’ case, both Clemens and Samperio stay quite narrow in defence and are more focused on supporting their near central midfield instead of following their full-back closely. They generally spaced themselves well between the two areas, allowing them to support both the centre and the wing from the half-space. Ultimately this had an important impact on the above-mentioned compactness through the narrow bank of four in midfield. There was a relatively strong occupation of the centre whilst they were still able to maintain stability in wide areas through collectively-strong shifting movements towards the flank. Even though they defended quite well throughout, Mainz showed some tactical problems deeper into the Schalke half as they struggled to develop defensive access well. This issue emerged after the opening stages of the game as Geis and Goretzka began to drop more frequently, creating a small 3v2 overload against Mainz’ 4-4-2 press. 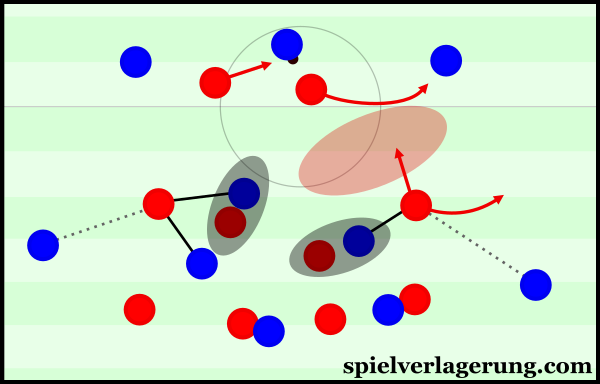 The away side were increasingly able to move the ball out of defence from one of the half-spaces, using the outside player of the newly-created three-chain to break Mainz’ access. This position provided quite a strong basis for them to then attempt to break the midfield line and move the ball into the centre as some potentially-dangerous situations occurred. Mainz struggled to develop access in the half-space during these moments. Unlike their Gelsenkirchen opponents, Mainz’ ball-near winger rarely moved higher up when they pressed and this impacted these situations. Behind Cordoba and Malli, the bank of four stayed quite closely together and half-space gaps began to open when the Schalke player drove the ball forwards. Mainz are not like the majority of teams who exercise a man-oriented defence. Despite their focus to the opposition players, they organise themselves well in relation to the ball as well as teammate and spatial aspects too. If a team organises themselves using just the opposition players as a reference point then the defensive scheme can become very individualistic. Their defensive coverage of other areas such as the spaces on the pitch and providing support to teammates is hindered due to the more linear approach of a man-to-man defence. A player’s positioning will not only be decided by where his oppositional counterpart is, but more by the ball position, how his teammates themselves are positioned and the distribution of space across the shape. Through organising themselves accurately according to the position of their nearby teammates, Mainz’ defensive scheme has greater balance against the opposition. This is largely through better control over space and (usually) a more cohesive defensive structure due to their recognition of these aspects. Despite the praise for Mainz’ defensive efforts, it must be noted that Schalke still managed to find access into the spaces between the lines. This was mainly achieved through the individual intelligence of Sané who demonstrated clever movements through the right half-space from his wing position. He managed to receive a number of passes behind Latza and Baumgartlinger when Mainz situationally lacked spatial compactness. However, when they managed to find the ball into these areas, they failed to capitalise on the strong position. In attacks often lead by the promising Sané, Schalke seemed to lack synergy when bringing the ball through the middle of the pitch and combinations commonly broke down. Alternatively, Sané looked to carry the ball through the space by himself with in some cases the use of diagonal dribbling to shield the ball away from pressure. However as a result of the individualistic nature of these attacks, they broke down with only a limited amount of potential. Coming to Mainz with the difficult task of restricting the influence of Yunus Malli, Schalke organised themselves in a 4-2-3-1 formation and used a more rigid man-oriented defence. When defending Mainz’ first phase of possession they looked quite orthodox. 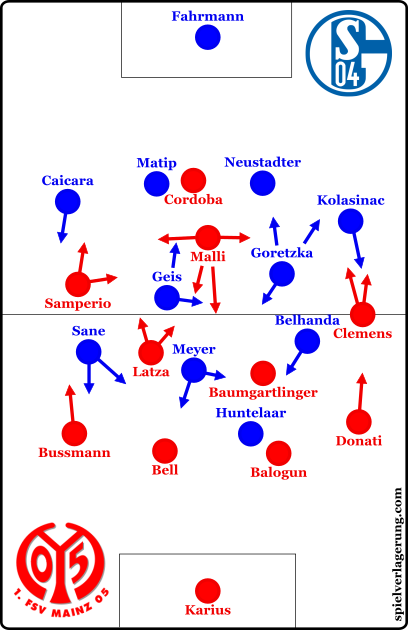 Meyer and Huntelaar were at the front of their mid-block and looked to cover any potential passes into the 6 pairing of Latza and Baumgartlinger. When pressing in the half-spaces, the ball-near winger would move up and apply off-the-ball pressure on the same-sided full-back so to maintain access and pressure against the touchline. For the most part this was quite effective. There were some slight issues in Mainz’ building game and the two midfielders didn’t offer great support in progressing the ball upfield. Latza had the tendency to become disconnected through forward movements whilst Baumgartlinger struggled to offer a great presence on his own. Although this improved somewhat as the game progressed, it certainly supported Schalke’s intentions to slow their development of the ball. When Malli (highlighted) dropped, he supported the build-up by opening passing lanes which Jairo especially took advantage of. Schalke did have some problems however when Mainz’ key man Yunus Malli dropped deeper. The forward, who possesses high team-tactical intelligence and is key for the integration of some teammates, dropped as a free man and was not always picked up by the man-oriented defence of Schalke. He managed to drop into some holes particularly within the first 30 minutes and from here he could progress the ball himself. When Schalke did manage to pick up the forward, he demonstrated his intelligence again by opening passing lanes for alternative routes forward. With a greater level of rigidity in their man-oriented approach, Schalke demonstrated some fundamental issues with man-marking. Between Geis and Goretzka the two followed their men more closely than Mainz and as a result were prone to becoming disconnected in the centre. They also lacked compactness in comparison to their opponents which was in some part a result of their players being dragged apart by marking responsibilities. The distances between Sané and Belhanda were quite significant and Mainz found space in the half-spaces particularly well – highlighting the disconnection between the wingers and their near central midfielders. Ultimately, Mainz’ winner highlighted another issue with Schalke’s man-oriented defence. Clemens moves freely from his right-sided position towards the left half-space and is not picked up at all as Schalke’s defensive co-ordination is lacking. The winger then plays an important part in the small combination which leads to the cross for Baumgartlinger’s finish. Mainz were able to pull of an impressive victory in a game which highlighted the differences between the two defensive systems. Schalke showed promise with the likes of young Sané threatening intermittently though Mainz’ superior collective performance separated the two sides in the end. Do you use any program to analyze a game? I’m curious how you go about analyzing a game. No programs, I simply watch the game and look out for features which are important and/or interesting to me as the match develops.